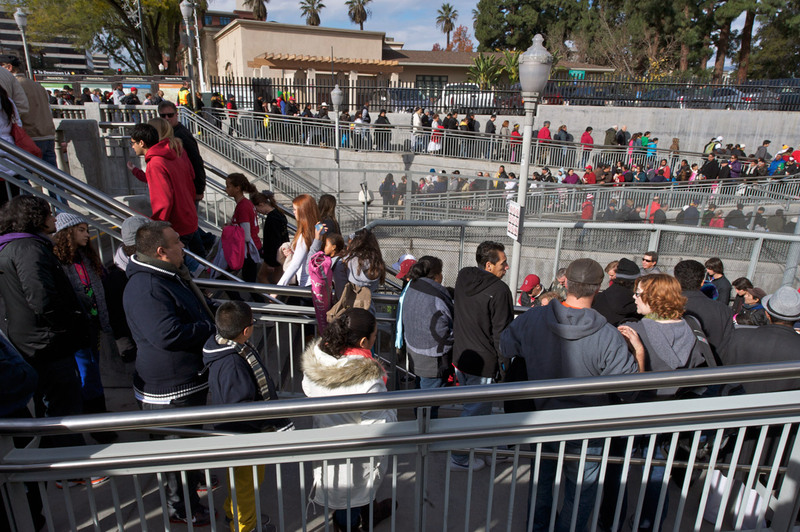 Parade goers exit as Rose Bowl fans arrive at Memorial Park Station. Photos by Gary Leonard. 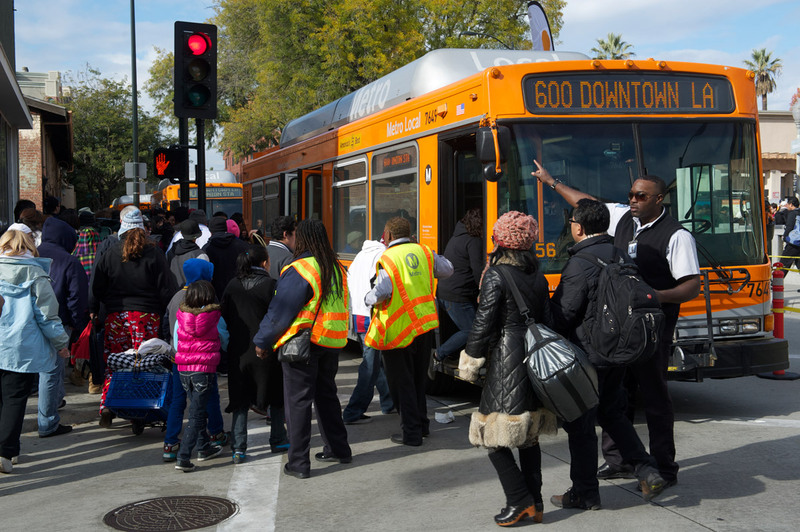 Coming and going: Gold Line scores on New Year’s Day. Photo by Gary Leonard. 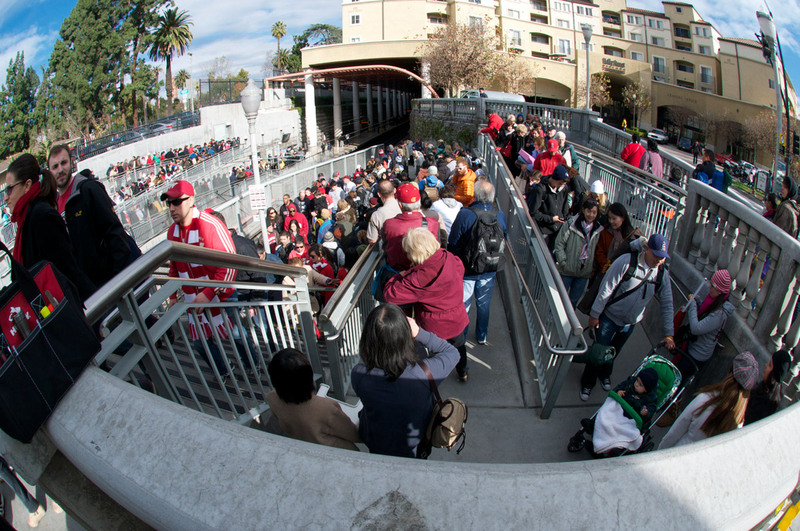 Metro once again offered plenty of service to both the Tournament of Roses and the Rose Bowl game on New Year’s Day. Ridership was pretty typical and Metro was able to clear lines at the Memorial Park station in Old Pasadena within an hour of the parade ending. Post-game crowds were particularly strong. For those who used the Gold Line yesterday, how was service? Comment please! Metro buses await exiting parade crowd. Photo by Gary Leonard. What do Universal Delights, kaleidoscope dreams and flying people have in common? I got on the Gold Line from Union Station about 7:47 a.m. At the first few stops, the operator announced over the PA that the train was full and another train would arrive in 5 minutes. The trip went smoothly and nobody complained or pushed. Most of the people got off at Del Mar or Memorial Park, but some did stay on til Lake or Allen to get spots at a less busy section of the parade. At the Allen station, Metro personnel on the platform were polite and prepared. Another job well done, Metro. What was total ridership on New Years day? I saw al ot of good usage of the TAP card and lot of first time purchases of the cards. I heard a figure of 700 people per 3 car train on the Gold Line. Oy! It was great to see all us Angelenos taking Metro that day! I was wondering if Metro expects a large crowd for major events, would they be able to remove the seats from the cars so it will be standing room only? That would be an efficient way to put more people into the trains than trying to squeeze everyone in that small aisle between the seats with the train operator constantly yelling at people.